Every year, thousands of inner-city homeowners receive flashy mailings promising to lower mortgage payments, decrease debt, and save money. Many, attracted by the seemingly low monthly payments, decide to take out a loan, often to refinance a mortgage. 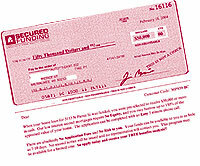 A few months or even years later, the homeowner realizes that monthly payments and late fees are higher than expected. After falling behind on payments, the house needs to be sold or put into foreclosure. What started out as a simple mortgage refinancing ends up costing the homeowners their house — and tens of thousands of extra dollars. This scenario is not uncommon. According to a report by the Center for Community Change, black residents of Milwaukee are four times as likely to be targeted by “predatory lenders” as whites. Nationally, blacks are twice as likely to be targeted. The lenders target inner-city minorities, especially older women. The line between predatory loans and “subprime loans” is not always clear. Subprime loans are loans given to people with less than perfect credit. The rates and fees are often higher because the lender assumes a greater risk. Predatory loans are often secured by the lender’s house and are typically taken out to make home improvements, refinance the mortgage, or consolidate debt. Sometimes a home repairman will work with a predatory leader. The repairman will knock on doors and suggest certain repairs — like a new roof or porch. When the homeowner says she or he cannot afford it, the repairman suggests a loan. The loans often contain hidden fees and an extremely high interest rate. According to Sanchez, some people in Milwaukee have been charged up to $14,000 in fees to refinance a $40,000 mortgage. Interest rates of 17-23% are also not uncommon. Sometimes, the loans contain “balloon payments.” The homeowner pays a small monthly balance for several years, but after three or five years, the rest of the balance becomes due. In many of these cases, the homeowners did not understand the process. When the full balance is due, many have to take out yet another loan. “For some people, the only option is to sell their house,” Sanchez said. Sometimes, she said, the lender purposely appraises the house too high, and the homeowner ends up with loans for more than the actual value of the house. When he or she cannot make the payment, the house is put into foreclosure. According to the Fair Housing Council, the percentage of foreclosure actions for properties with mortgages with subprime lenders grew from 4.1% of all foreclosures in 1995 to 23.6% in 2000. Several community organizations are fighting back. In 2002, the Metropolitan Milwaukee Fair Housing Council helped start a county-wide initiative to fight predatory lending. The program, called Strategies to Overcome Predatory Practices (STOPP), includes a campaign to educate the public and a free help-line. Community advocacy groups like ACORN Housing are also working to educate homeowners about the dangers of predatory loans. A new bill to combat predatory loans is currently making its way through the state legislature, but many community organizers say it is not tough enough on lenders. The bill would require lenders to disclose more information about the terms of the loan and would prohibit lenders from engaging in a “pattern and practice” of making loans to people who are clearly unable to afford the payments. “It’s not as strong as it could be,” Sanchez said. Shop around. Make sure you’re getting the lowest possible interest rates and fees. Beware of balloon payments. Some predatory lenders offer low monthly payments; but, several years later, the entire balance of your loan becomes due. Don’t be fooled by extremely low monthly payments. “If it sounds too good to be true, it probably is,” said Emmett Gross, ACORN Housing organizer. Before you sign anything, call STOPP’s “Don’t Borrow Trouble” hotline at 278-9190. Counselors will give you free advice on whether the rates and fees are appropriate. Make sure you understand everything you sign. Don’t allow yourself to be pressured to sign anything you don’t understand or don’t want. If you are not fluent in English, have someone you trust read over the documents and explain them to you. Never sign a blank document the lender promises to fill out later. If you have bad credit, work with a credit counselor to repair it before you apply for a loan. “A lot of people just assume, ‘Oh, my credit is shot. There’s nothing I can do,'” Gross said. “But a lot of people’s credit really isn’t that bad.” Gross said that, for many people struggling with debt, taking a year to repair your credit and pay some past-due bills makes sense and will save you money in the long-run. Be cautious of lenders who promise to combine different kinds of debt with your mortgage. If you can’t make the payments, you could lose your house. In most cases, you have three days after you sign a loan to change your mind. If you have just signed a loan application and are having second thoughts, call the STOPP hotline (278-9190) right away.